He brought with him a carpenter from Pennsylvania and together they built the first sawmill in Lorain County, as Shupe knew there would be a great need for lumber as settlers arrived. With lumber from his new sawmill, Shupe built the first frame house in this area and it still stands today. 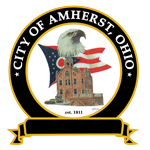 Amherst was known by many names during those founding years – one of which was the Corners. Jonas Stratton, a cabinetmaker who came from Amherst, New Hampshire in 1819, started a cabinet shop at the Corners and gave the name of Amherst to the township. Among the first commercial establishments were a gristmill, saw mill and several quarries. Underlying Amherst were extensive layers of sandstone, a legacy from earlier geologic times. This sandstone was responsible for much of the growth of the town for some years. The quarry industry brought the railroad to our city and stimulated the shipping industry on Lake Erie. With their development many Swiss immigrated and added to the large numbers of German settlers already established. The sandstone quarries produced a fine grade of stone used in many major buildings in Ohio and Canada. 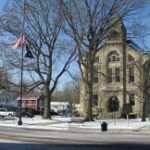 Now, a growing city of an estimated 12,000 people, Amherst offers an alternative to suburban and urban living by retaining small town friendliness complete with commerce and industry, excellent schools, hospitals, churches, parks, service clubs and other amenities that enhance the quality of life. Most of the homes in the city are single family dwellings, although duplexes, apartments, multi-family units and garden apartments may be found. More than a dozen new home developments have been built within the city in the last ten years, and more are under construction currently. The city has many older homes and buildings, several of which are on the National Register of Historical Places. Most of these homes are located on Cleveland Avenue, Park Avenue, or downtown. Treasurer and Law Director are all part-time positions. These positions are elected. Council members are elected to two-year terms. Four serve as ward council members and three serve as council-at-large representatives. The council president is elected and serves as the eighth member of council. The president presides over all council meetings, which are held every second and fourth Monday of the month at 7:30 pm in City Hall. The Clerk of Council is appointed by council. Committee meetings are the first and third Monday of the month. All meetings are open to the public. 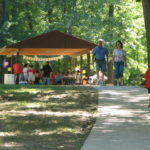 Residents may participate in discussions.